I started to work as a freelancer just this month and I must say it really is challenging. Being a freelancer is tough. Proving yourself worth the job and every penny of your client is tougher. One of the essentials in working freelance is your portfolio. Sadly, i cannot provide the sites and projects that I have done in my former office. It’s that non-disclosure aggreement I had agreed with. Darn! Though you have written numerous skills in your resume, you must still prove that you really possess them. You would undergo various exams both written and hands-on with the most impossible questions but still you won’t get the job. Bidding jobs in various project sites is way more frustrating. Most bidders are so desperate that they give ridiculously low asking price. Too bad the employer usually ended up hiring another developer costing him four times than the actual price. The reason? Poor quality of work. I whine up of being a freelancer but here I am in its world. It always makes me think, why do I want to be a freelancer? Being a freelancer for me should be fun. You can work freely, do as you may provided that you finish your tasks. If you were able to complete your job in the fastest amount of time, you get a lot of rest. You can pause in an infinite amount of time after each project and still have the money to spend. In helps you grow as a person and develops your skills more. In freelancing, you meet various people. You learn to adapt to different people. You gain friends. You experience different programming challenges. It pushes you to study and learn new technologies, methods and frameworks. It makes your brain cells work to find solutions to various problems. There are a bunch of opportunities but it’s getting them is the one giving me the headache. This entry was posted in Personal and tagged freelancer, freelancing. I went to Ortigas Friday lunch to pick up my salary and have it encashed. I wanted to put it in a frame but no-can-do. I need money to pay for my expenses. It has been a month of being jobless. Email testing has been a headache for most developers. You need to upload your script every now and then just to check if your script is working. A tedious work especially when you got a bunch of email script to work on. It would have been very nice if you could do it locally in your pc. XAMPP provided an email server to PHP developers that would help ease our suffering. 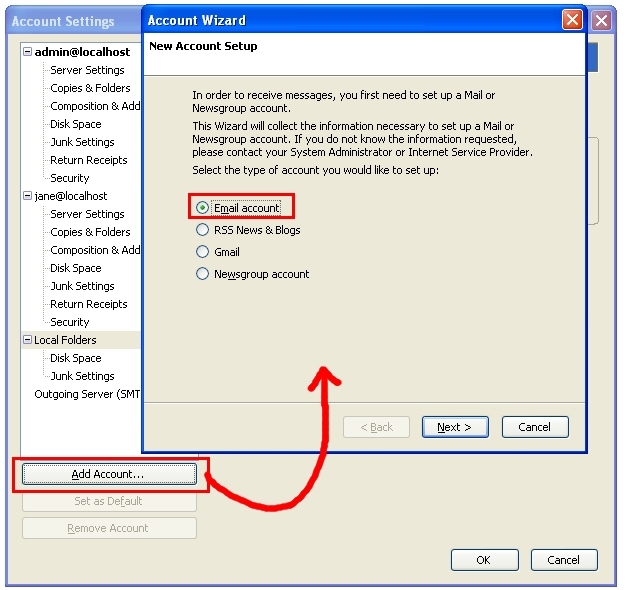 Mercury is a pre-installed mail server in the XAMPP that only a few knows how to use. I am one of the many that don’t until recently, I needed to test a lot of email scripts and frequent uploading is oftentimes vexing. I have found a good thread that helped me in setting up the mail server in my computer. In this tutorial, we will be needing XAMPP bundle (I am using version 1.7.0) and Thunderbird as our email manager. I will be assuming that you have successfully installed both softwares in your computer. Open your XAMPP Control Panel(CP) (Start > Apache Friends >XAMPP Control Panel) and make sure that Mercury mail and Apache is running. If not simply click the ‘Start’ button beside them. In the XAMPP CP, open the Admin area of Mercury by clicking the corresponding admin button. Warning: Do not close any of the window inside the admin area. 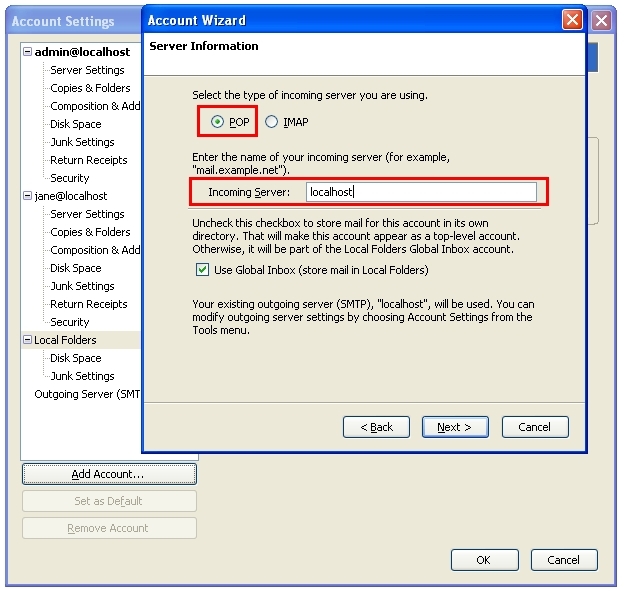 In the admin area, go to Configuration > Manage Local User. In here, we could set the admin password and create new user. 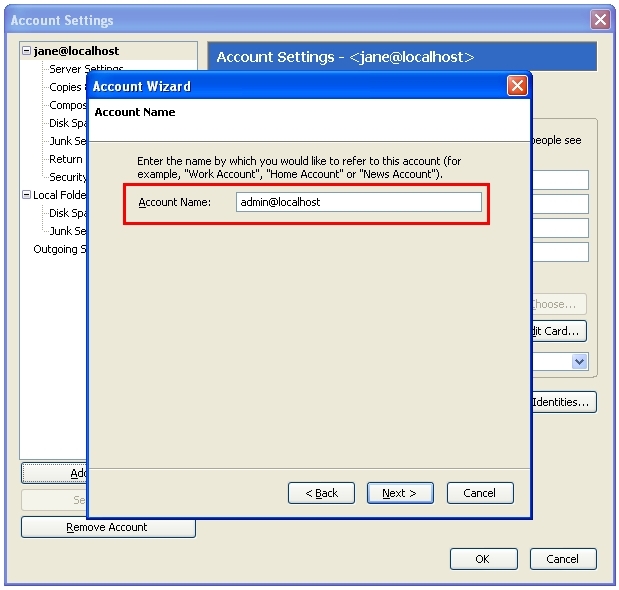 To add admin password, select admin then hit ‘Change’. Fill-up ‘Mail Password’ then ‘Ok’. 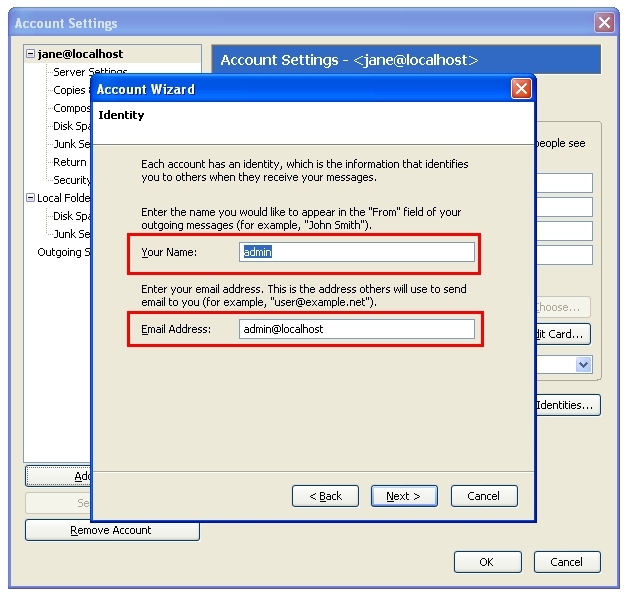 To add new user, click ‘Add’ then enter username and password for the user. Here, I created useraccount ‘jane’, so her email will be ‘jane@localhost’. We use ‘localhost’ because we are running our mail server in our localhost. 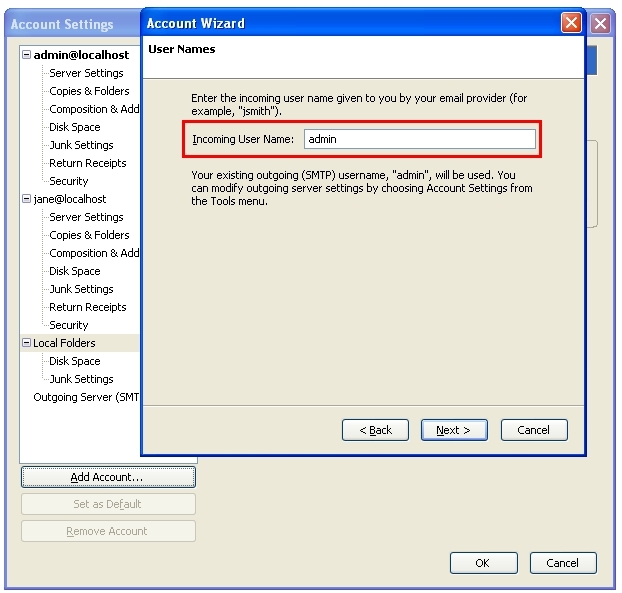 To set our default email address, open file ‘XAMPP\apache\bin\php.ini’. Warning: If you are not familiar with php.ini file, it is best that you a save copy of the file before commiting any changes to it. Search for ‘;sendmail_from’ and change this line to ‘sendmail_from = admin@localhost’ then save. We must now restart our Apache server. After setting up our mail server, let us now configure our Thunderbird so that we could read the emails that we would be sending in our localhost. Open up the Thunderbird browser. Go to Tools > Account Settings. In the new window, Click ‘Add Account’ then follow the steps from the images below. 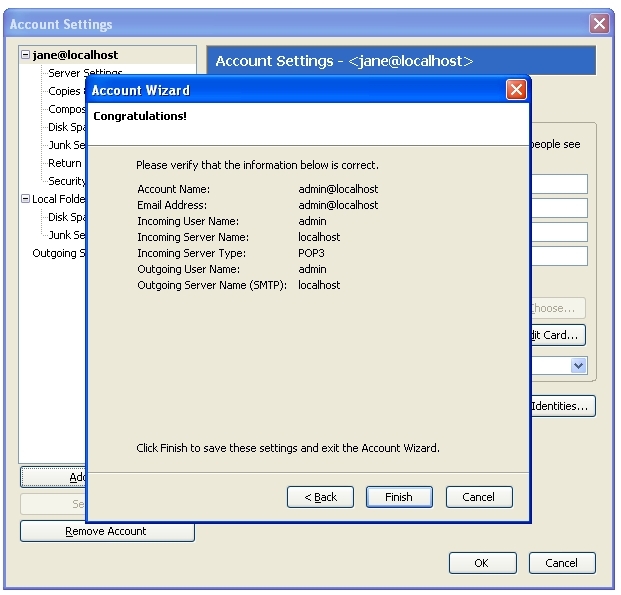 Create an account for admin@localhost and jane@localhost (or whichever user account you created). In your ‘XAMPP\htdocs’ create a folder named test. Inside ‘test’ folder, create an email script similar to the one below then save it as ’emailtest.php’. Run your script in your browser. 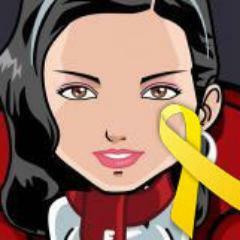 ‘http://localhost/test/emailtest.php&#8217;. The output should be ‘bool(true)’. 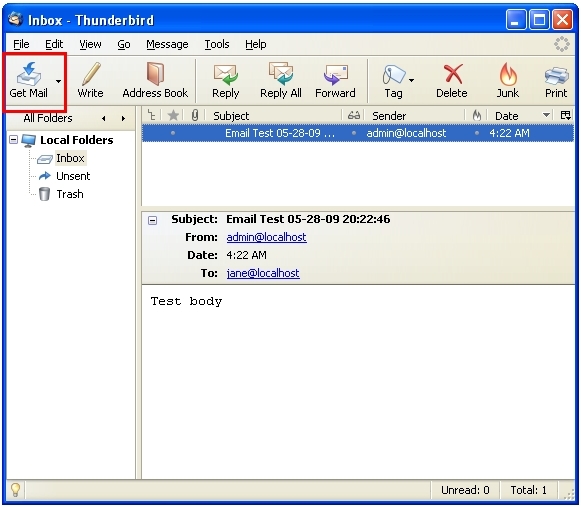 Open your Thunderbird browser then click ‘Get Mail’. Enter the corresponding passwords once the prompt box appear. And there you go. You can now run your email script in your local pc. This entry was posted in web development and tagged email, email server, PHP, web development. I haven’t been active in Multiply for a long time now and rarely visited my account. I decided to pay it a visit and check out the latest about my friends in Multiply. I was amazed to see 50+ new replies in my posts. Checked it out and to my surprise it was a single person posting the same message for every post that I made. Don’t know what kind of creature it is but I’m impressed with its diligence in commenting. I checked out his page and I was not surprise to find out that the creature’s account doesn’t exist anymore. And because of this incident I will be closing my multiply account from public. This entry was posted in Personal, Social Network. One of the greatest function ever added to PHP5 is __autoload(). It has been a very efficient help especially for an OOP-driven site. Through this function, there is no longer a need to include/require your class file every now and then. Once you have configured your __autoload() function, you are now good to go. But what if you are using PHP4? Just last week, I got devastated when I was informed that PHP version of my client was still in PHP4. My OOP coding was already in PHP5. I have to reconstruct my coding to adapt the server. So sad. For some time I tried to think for a remedy. Luckily after some time, I found a solution. This code works assuming that the filename is the same as the class name. Just add the file checking using file_exists() function. This entry was posted in PHP, web development and tagged php 4, php 5. I have been using Thunderbird for my feeds at the office but because I have already resigned, I have left all my feeds lists. I am now trying to gather again all my subscription. I have heard a lot of good things about Google Reader so I decided to use it as my rss reader. This entry was posted in Personal and tagged feeds, rss, subscription. It has been an intense week waiting who would make it on the final two. I cannot watch american idol until ten hours from now. But with the big help of Twitter, I was able to get the latest happenings in the show. With him in the top 2 spot is Kris Allen and the unlucky fella who got voted off is Danny Gokey. This entry was posted in TV Shows and tagged Adam Lambert, American Idol, TV. I have customized my twitter background image. This entry was posted in Personal, photoshop, Web Site and tagged twitter. I tried to practice vector art using photoshop. Kinda tricky and messy at the beginning. Thanks to the link Sid commented on her album. I uploaded the higher resolution in my deviant page. This entry was posted in Personal, photoshop and tagged photoshop, vector, vector art.